"...And what are gods, anyway? What I may call a 'god,' you may deride as daemon, a disembodied anima, a demiurge, a genius loci or one of a thousand deprecating sobriquets that the 'learned' use to stratify that which they do not understand, to give names to things they will never comprehend, without thought to what it is those things call themselves. Me? I know not what a god is... yet. I hope soon to have first-hand knowledge." Many are the contradictions possessed by men and women of faith, and the priests of Gorus Na'al are no strangers to the contradictions that their faith foists upon them. The god of blood, pain, brutality and torment feasts on the carnal misery of mortals in whatever ill-used corners of the world he might find them, the priests of pain know, and often claim that all blood that falls upon the ground marks his territory, yet they are also aware that Na'al, bloody Na'al, is one of the cthonic powers, imprisoned millennia ago beneath the face of Ore, shackled in bonds of True Iron and buried alive in vast stone oubliettes. 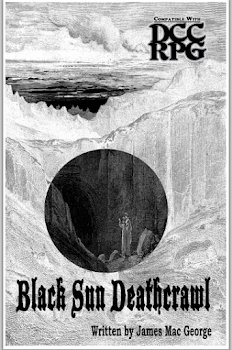 Thus it is there, in the underworld caverns and mythic catacombs that honeycomb the Iron Planet, that the truest temples to the Perfect and Blessed Lotus of Agony, the Taloned Prince of Ecstatic Exsanguination, the Pure and Incorruptible Essence of Bodily Ruin, have been erected. Thus, the priests of Gorus Na'al who take up the closest physical proximity to their deity are naturally fathoms away from where the greatest practices of his art -- and the opportunity to practice this art -- may be found, and thus the psychic energies that are released upon battlefields, in torture chambers, around ritual fires often go uncollected by Na'alites. Rather than allow the soul-stuff of sheer torment dissipate unused -- or worse, be collected by those of a non-Na'alite faith -- the deep priests of Heaven's Gleeful Butcher, under guidance of their divine patron, have constructed a series of devices to go forth unto the world of Ore to collect the plaintive psychic wails of the wounded, the dying, the flayed, the tortured. Storing these energies in milky-white pearls of purest agony, Na'al's otherworldly machines flit about the world, hungrily collecting torment for their master. As cycles like this go, it was not long before "collecting the world's torment" became "creating fresh torments," and thus was the golem-like creation known as the Excruciator first devised. A techno-priest of the Holy Howl of Heaven's Nerves Splayed Wide built this perfect automaton an age ago, and ever since the sinister synagogues have treated the construction of such monstrosities as the highest of sanguinary sacraments. A self-motive automatic torture chamber, Na'alite Excruciators clatter through both the World Below and the World Above on six metal legs not unlike those of crabs. 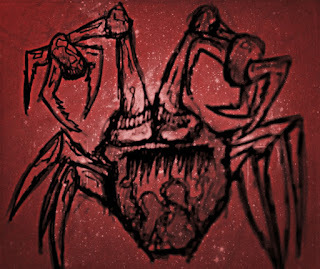 Two crane-like mandibles ending in serrated-bladed grapplers claw, catch and hoist what victims survive the lacerations into an aperture that resembles nothing else so much as a fanged maw; beyond that aperture lie three discrete skeins of machinery and implements that constrict, constrain and slowly, agonizingly torture up to three mortal beings to death. The throes of these tortures and deaths are collected in the "Heaven's Pearl" that hovers inside a compartment atop the elephant-sized constructs body, ready to be plucked by a priest of Na'al -- or any adventurer lucky enough to survive the Excruciator's ministrations. Init +2; Atk +7 melee grappler (1d12 plus grapple, see below); AC 16; HD 6d10+6; MV 90'; Act 2d20; SP Construct traits, Grapple (see below), Torture skeins (see below); SV Fort Immune, Ref +2, Will +6; AL N.
Grapple - After successfully striking a victim with its grapplers, any creature that survives the attack will be grappled by the Excruciator. If the victim is still grappled at the beginning of the Excruciator's next turn, the Excruciator will place it within the construct's torture skeins (see below). 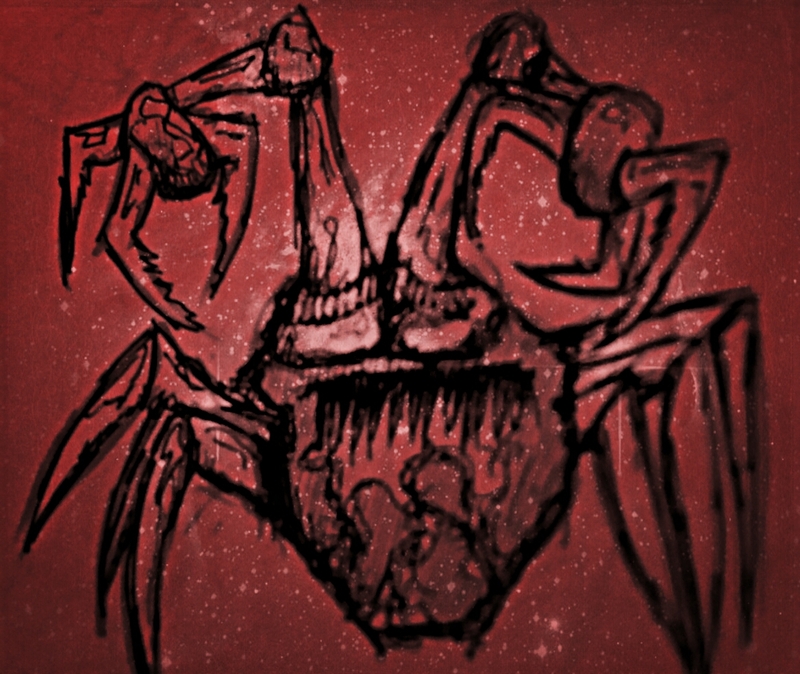 Torture Skeins - While a creature is within an Excruciator's torture skeins, it is incapacitated in pain (cannot act other than to scream in bloody agony) and takes 1d3 points of damage to its highest Ability score of the following each round: Strength, Constitution/Stamina and Dexterity/Agility. Should any of these ability scores be tied for highest, the damage is done to both (or all three) scores as the Excruciator has discovered a serendipitous (from its point of view) confluence of torments that it will record and revel in during future torture sessions. It's up to the Ref/Judge/DM to sort out what sort of mystical effect the "Heaven's Pearl" inside the Excruciator may have.